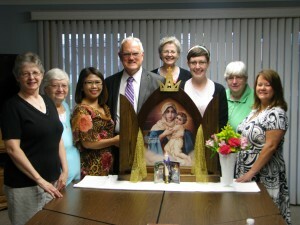 The MTA (Mother Thrice Admirable) Illinois Groups are part of the Schoenstatt International Movement that meet in Illinois. An important goal of the Schoenstatt movement is to continually learn and live our faith. 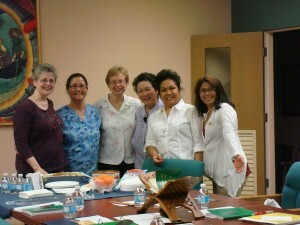 Monthly education meetings using materials from Fr. Kentenich, our founder, and other materials from Schoenstatt Fathers, Brothers, Sisters, and lay members guide our spiritual growth to better live our lives in Mary’s hands. Our educational goal is to build a network of Living Home Shrines with the Blessed Mother as a gift for the Church for the realization of the domestic church in our families, parishes, and dioceses. The Three Pillars – A study of the Promises and Requests of the Covenant of Love which readies one to make the Covenant of Love with the Blessed Mother Thrice Admirable, Queen and Victress of Schoenstatt. My Home, Your Shrine – A study of the Home Shrine which readies one to invite the Blessed Mother into one’s home as Mother and Queen to renew and educate the family in the Nazareth Family Ideal. Once renewed and educated, she then sends these families out to renew the world around them. My Covenant Way – A study to deepen and intensify our commitment to the mission of our founder, Father Kentenich, and surrender ourselves to the Blessed Mother Thrice Admirable more fully. We offer ourselves to the Blessed Mother as her instruments and we want to be even more active for her. The Pilgrim Mother Apostolate – We reach out to others through the Pilgrim Mother Apostolate to invite them to get to know Schoenstatt and Our Mother Thrice Admirable Queen and Victress of Schoenstatt. We offer a three-year program of Visit Notes to those who receive the Pilgrim Mother Shrine in their homes. The Visit Notes educate the members about the Schoenstatt Spirituality and include topics about The Three Pilgrimage Graces of the Shrine, The Covenant of Love, and the Home Shrine. Typically meets the third Tuesday of every month at 6:30 pm in the Parish Office at Mother of Perpetual Help Catholic Church, Maryville, IL.